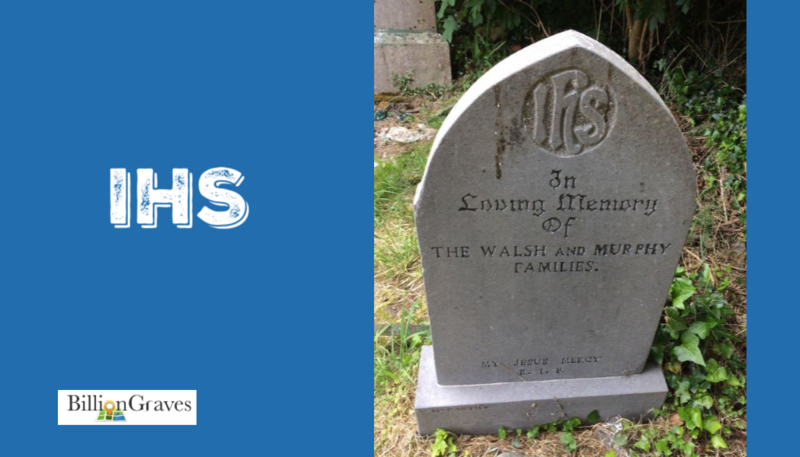 Are there Irish gravestone symbols at your ancestor’s final resting place? As you learn what the symbols are and the meanings behind them you’ll come to understand your heritage better. My father was born into a strong Irish family – on St. Patrick’s Day, no less. So his parents, quite fittingly, chose the middle name of Patrick for him. But even if there isn’t a drop of Irish blood in your veins, your walks through the cemetery will be far more interesting if you understand Irish symbols. 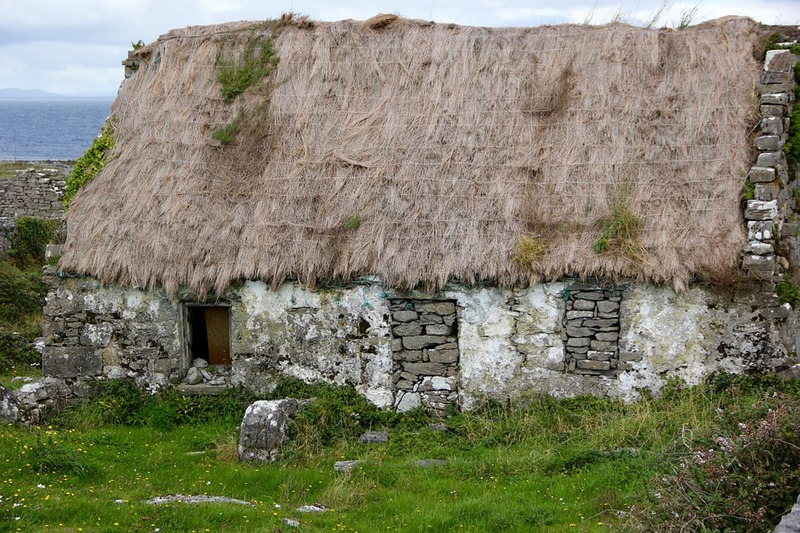 Between 1845 and 1855, the potato famine years, more than 1.5 million immigrants left Ireland for America with the hope of a fresh start. So a huge number of gravestones in America have Irish symbols on them. 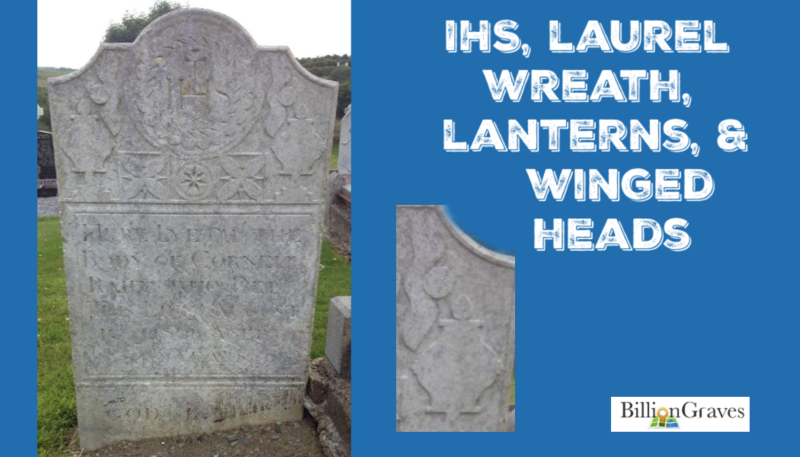 Many of these Irish gravestone symbols were used by other cultures from the British Isles as well – those hailing from England, Scotland, and Wales. So chances are, most Americans will find some of these symbols on their ancestors’ gravestones. Anchor gravestones are common in Irish port towns. Some anchors on gravestones were symbolic, such as anchor-crosses that were used as a secret symbol by early Christians. 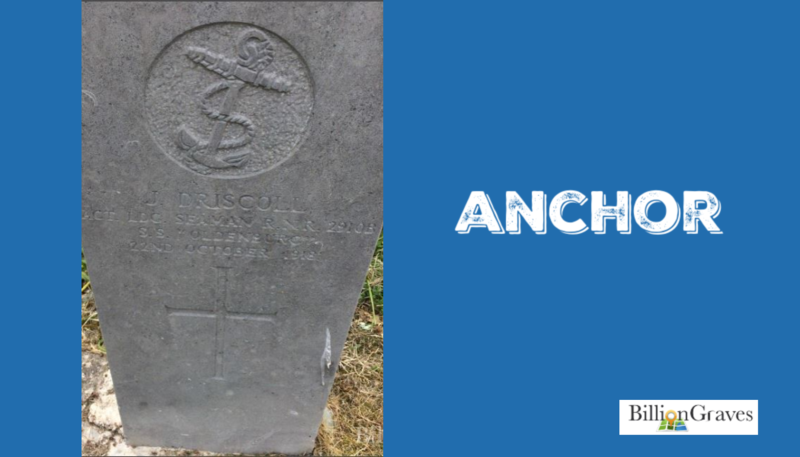 But this anchor simply represents the occupation of a deceased Irish seaman. Beneath the name, date, and epitaph is a cross, indicating that this seaman was a Christian. Both anchors and crosses were often used as symbols of hope. Lifelike angel figures guard the gravestone of this poet, composer, and musician. Over time, as opinions changed, angels made their way into burial grounds as long as their faces were either covered by their hands, tucked under their folded wings, or bowed toward the ground. This pair of angels are gazing downward. 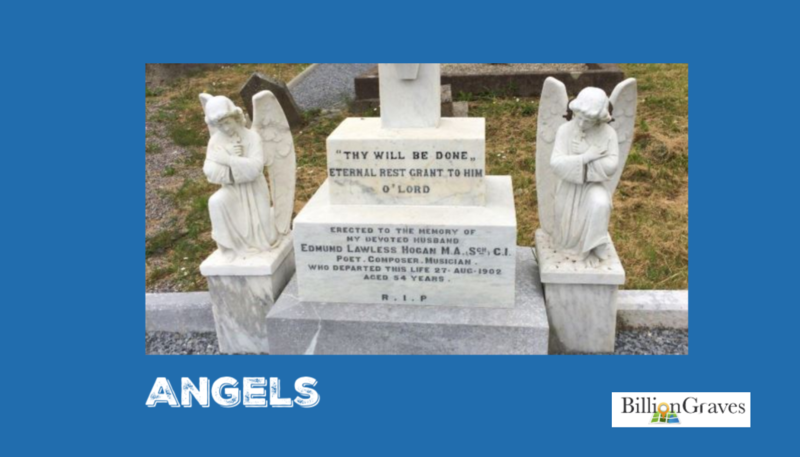 These angels’ arms are crossed, meaning that they are seeking a blessing. This is reflective of the way Irish parishioners approach a Catholic priest during sacrament services. Arms are crossed to show that they are ready to have his hands placed upon their heads for a blessing. 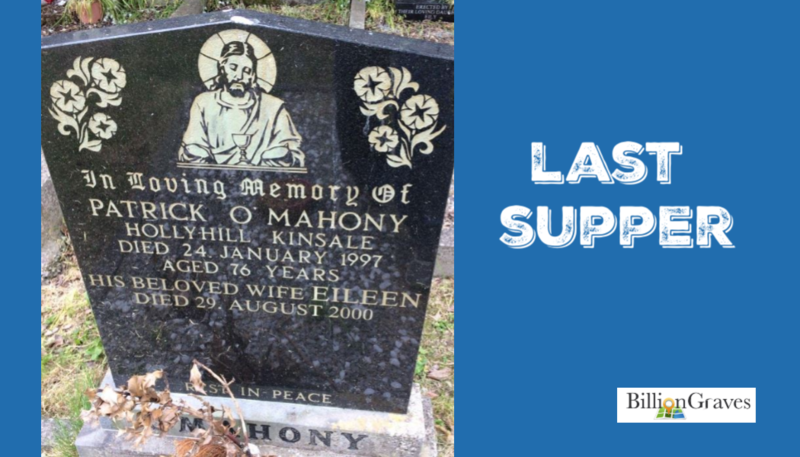 The gravestone in the photo bears a phrase that is common on Irish headstones, “Thy will be done.” These are the words Christ spoke during his final hours on earth in the Garden of Gethsemane. 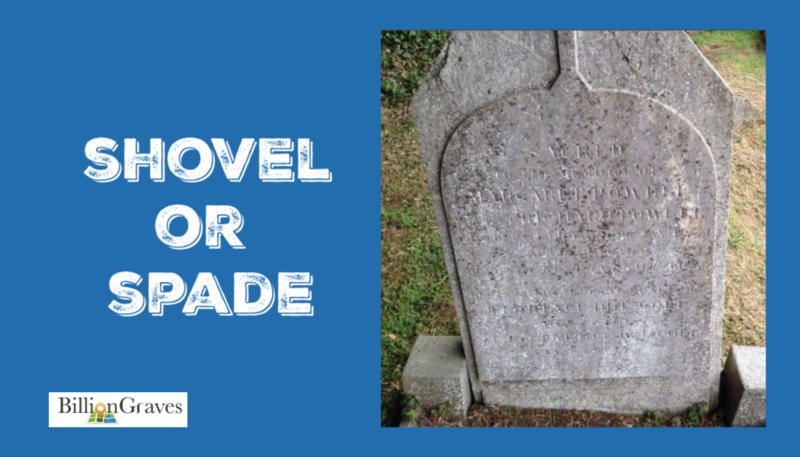 In an unusual fashion, this gravestone was erected by friends – along with 1 family member. You have probably heard of a fife and drum corp, which is a musical ensemble made up of fifes (small flutes with 6-8 finger holes and no keys) and drums. Fife and drum corps were popularized in European military units where they were used to keep up morale and provide rhythm on marches. 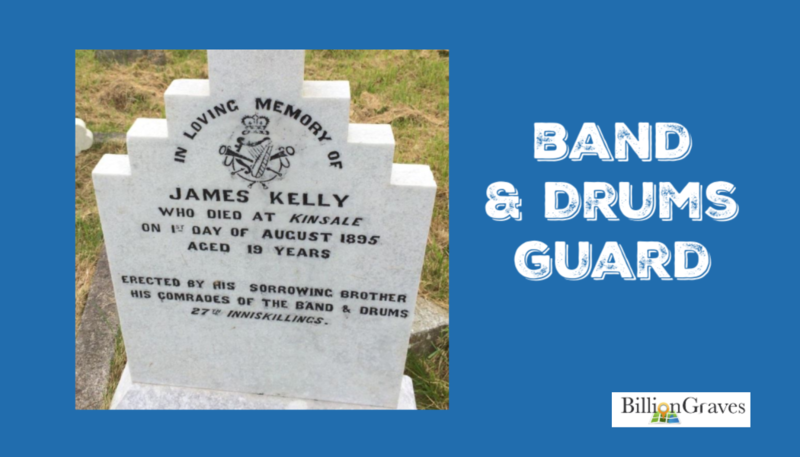 Band and drum guards served a similar purpose in Irish military forces. They were made up of drummers and bagpipers, who in later years were dressed in their clan’s plaid tartan kilts. Click play below for Irish bagpipe and drum music. The drum kept time for marchers. Ancient Celts used war drums called bodhráns. They had hollow wood frames. Hands were inserted inside the frames to change the tone and a goatskin was stretched over the top. In the Irish rebellion of 1603 the bodhrán was used as a battle drum, providing a cadence for the marching warriors and the pipers. The bagpipes were an important part of early Irish military band and drum guards. But unlike tiny fifes, they were bulky and heavy. So they fell out of favor over time due to their cumbersome size and shape. However, bagpipes retained their traditional role at Irish military ceremonies, weddings, religious festival, and parties. They were also played at funerals or wakes, as the deceased was lowered into the open grave. The headstone in the photograph above marks the graveside of a man who died in 1895, at the age of 19. 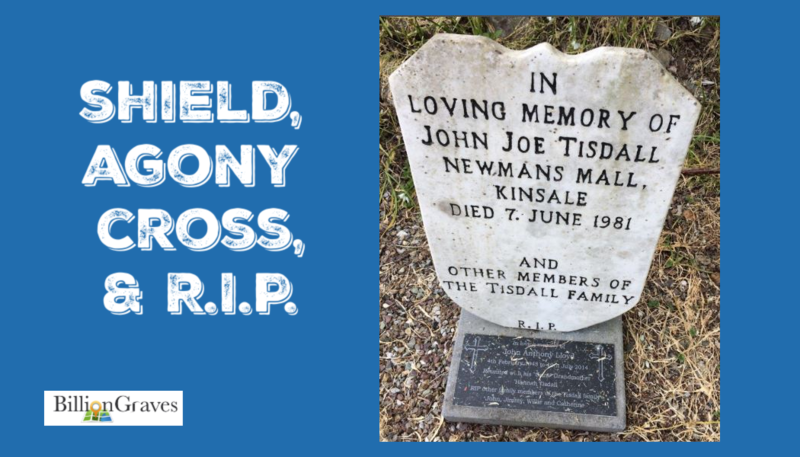 He passed away in the beautiful seaside town of Kynsale*, in County Cork. The emblem on this gravestone features musical instruments beneath a royal crown. The reigning monarch in the United Kingdom at the time was Queen Victoria. One of the responsibilities of the band and drum guard was to protect the queen. Watch for symbols of musical instruments on your ancestor’s gravestones. Then do a little research to find out how that music may have impacted your family’s life. It may have you dancing an Irish jig! The top of this gravestone looks a bit like a staircase. 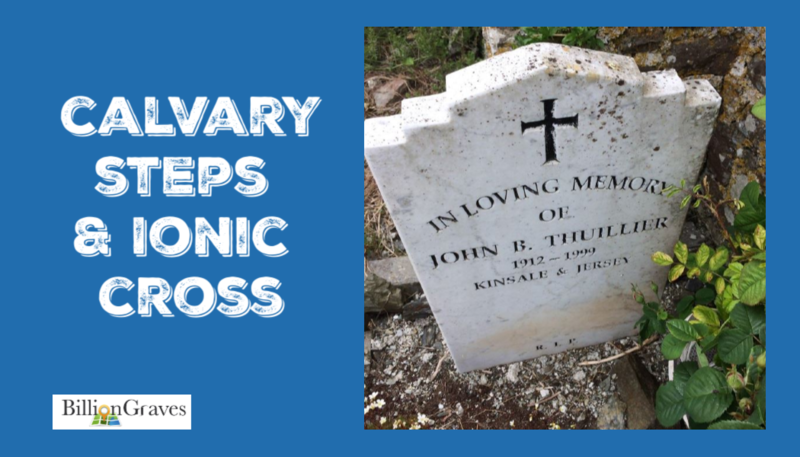 It is symbolic of the steps Christ took to Calvary or Golgatha on his way to make atonement at the cross. The three steps are said to represent faith, hope, and charity. Similarly, there is a type of cross called the Calvary Cross that is mounted on top of a three-tiered platform. Beneath the pinnacle of the steps on this gravestone is an Ionic Cross which flares outward at the ends of each arm. The Celtic Cross is a nod to ancient pagan sun-worshipers as well as a Christian symbol. 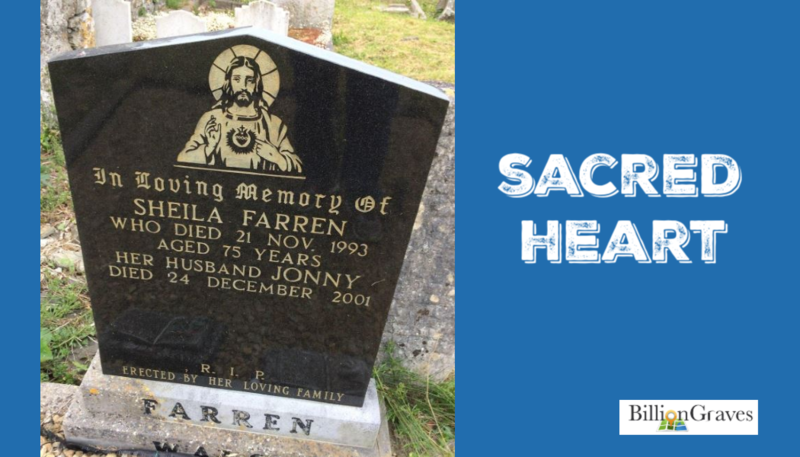 This gravestone combines the Latin Cross in the forefront with a circle, representing the sun, at the back. Irish legends claim that St. Patrick introduced the Celtic cross in Ireland as a way to guide pagans to Christ. At the center of this Celtic Cross is a lily. Lilies have long been a symbol of hope and rebirth. Even today, white lilies are the plants most often sold during the Easter season. The lily on this gravestone symbolizes the hope of a rebirth, or restoration of innocence, for the deceased. Lastly, this headstone has a shield at its base. 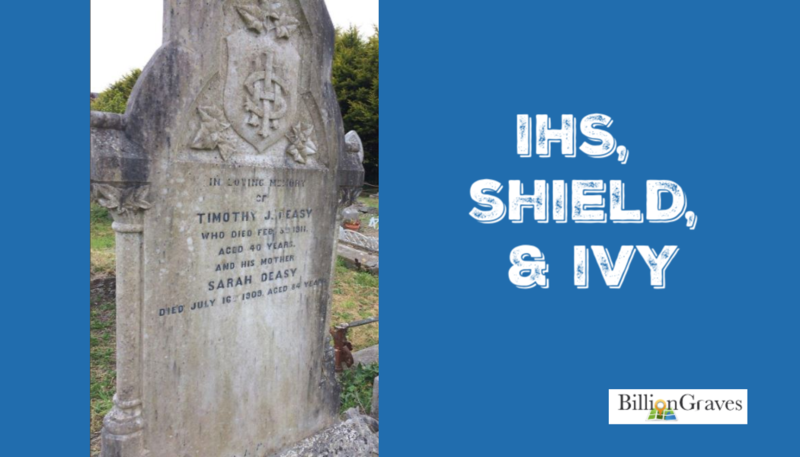 Shields or crests were used in Ireland to denote family or clan relationships. The emblem on this gravestone is a tribute to the faith of the deceased. 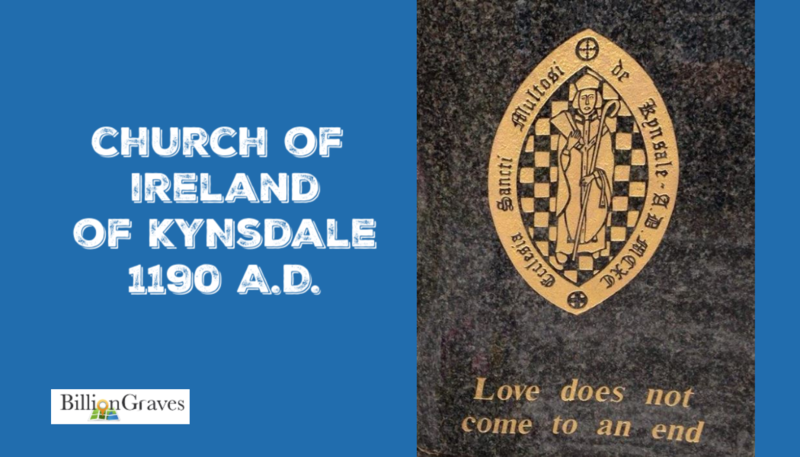 It reads, “Ecclesia Sancti Multosi de Kynsale, A.D. MCXC,” meaning the “Holy Church of St. Multose of Kinsale” and the year it was founded, 1190 A.D.
St. Multose Church, also called the Church of Ireland, is of Old Norse-style construction. Colors dance across the wooden floors when sun shines through the stained-glass windows. Ancient tombstones fill the church yard. During the Middle Ages, the most faithful church members were buried inside of the churches beneath the floors, in the walls, or in crypts above ground. Those buried closest to the altar were believed to have the best chance of reaching heaven. The less faithful were buried outdoors in the churchyard, enclosed by a stone wall. Those who did not affiliate with the church, who had gravely sinned, or who had been excommunicated were buried outside of the churchyard. Frequently those in the last group were in unmarked graves and their gravesite was trampled by wandering cattle and sheep. 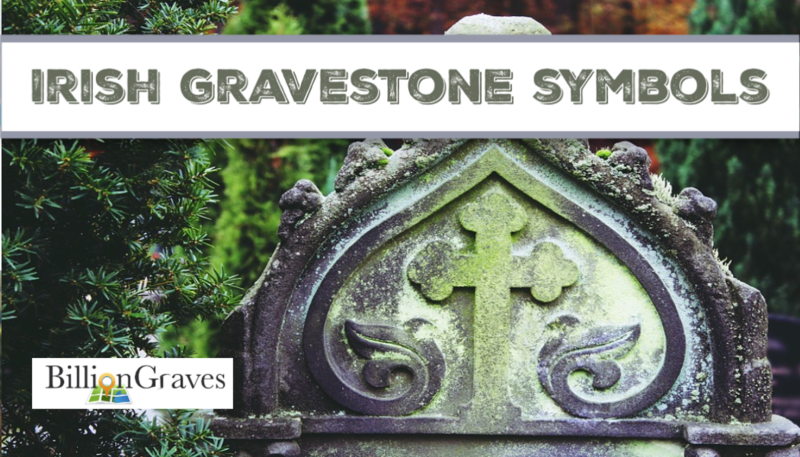 If your ancestor’s gravestone is inscribed with the name or emblem of the church they attended, you have found a genealogical goldmine! Follow up on your discovery by searching out church records that may yield baptismal, marriage, and death dates, as well as names of other relatives. 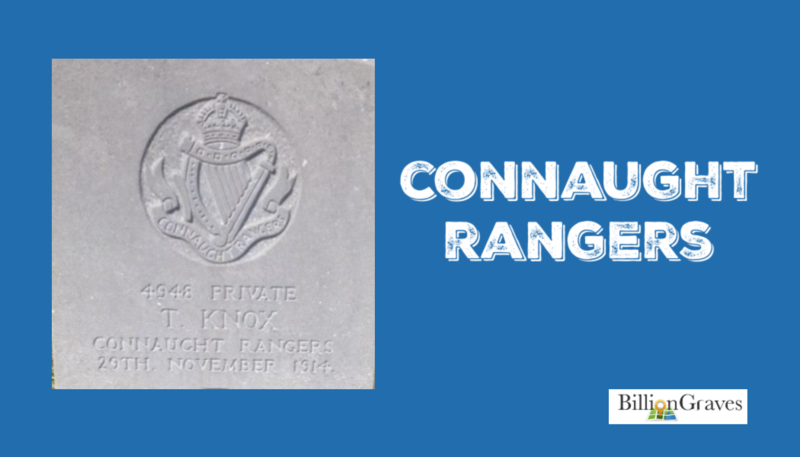 The Connaught Rangers were an Irish infantry line of the British army, organized in 1881. In 1914, they were called up to fight in WWI. That same year, the French Village of Guillemont was captured by German soldiers. For two years, attempts were made by many different military forces to rescue the Village of Guillemont – all without success and at a great loss of life. 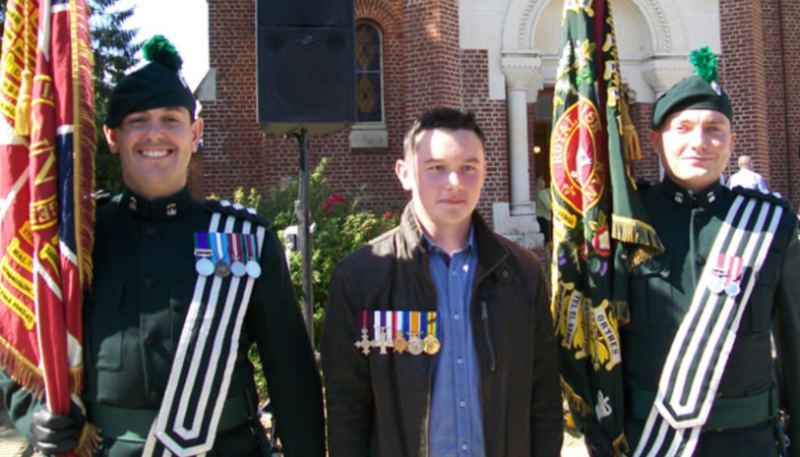 Finally in 1916, the Irish Connaught Rangers were successful in freeing the Village of Guillemont. Now they are forever remembered in that area of France. Finding a military emblem on your ancestor’s gravestone gives you a special opportunity to preserve the memory of their sacrifice and share it with their descendants. 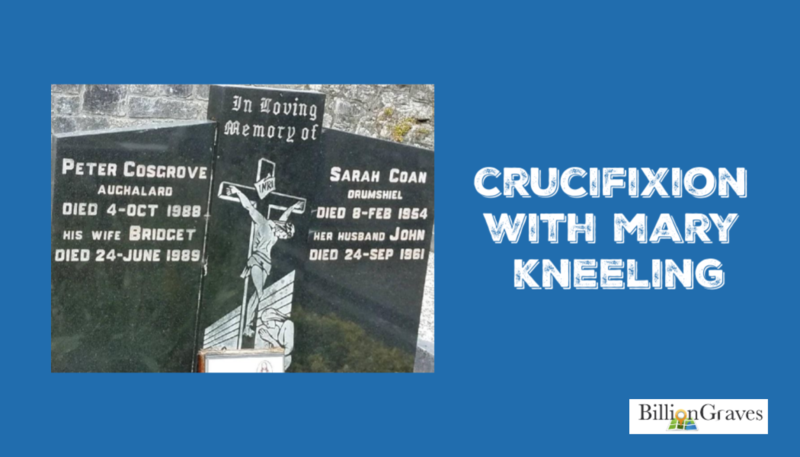 The etching on this Irish gravestone depicts the crucifixion of Jesus Christ with his mother, Mary, praying at the foot of the cross. Mary’s sorrow at this moment must have been unbearable. With the intense love of a mother, she had witnessed her son’s physical, emotional, and spiritual pain. When Jesus was a baby, Simeon, a man serving at the temple in Jerusalem, told Mary, “a sword shall pierce through thine own soul also” (Luke 2: 35). Significantly, this gravestone etching shows shafts of light falling over Mary, indicating that was receiving revelation and being comforted. Gravestones with any form of crucifix indicate that the deceased was Catholic. IHS are the first three initials (iota-eta-sigma) of the name Jesus in Greek: ΙΗΣΟΥΣ. This symbol was introduced in Ireland in about 1780 and was highly popular around 1810 to 1830. At first glance, this gravestone may seem to be a tribute to wealth, since the symbol seems to be a dollar sign. But in reality, the symbol represents the intertwined letters I, H, and S – the same letters as in symbol #9. The intertwined letters are mounted on a crest, which represents family. And the crest is surrounded by ivy, which is symbolic of life and clinging to life. When these symbols are “read” together they tell us that the deceased was a Christian that valued their life and and loved their family. 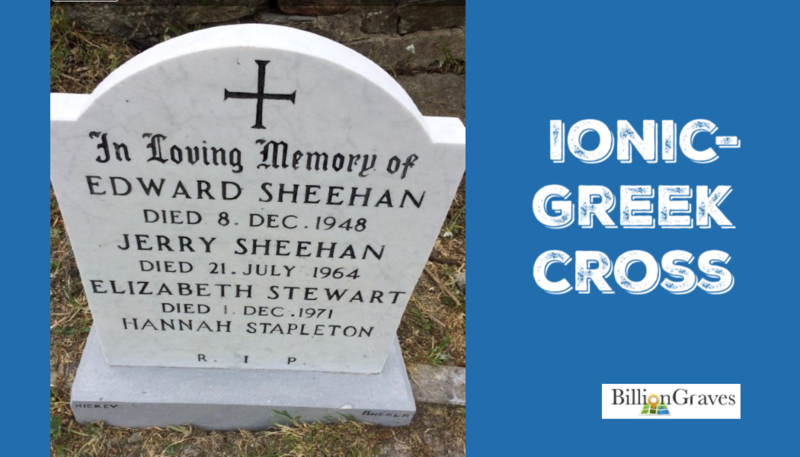 The cross on this Irish gravestone is a combination of both Ionic and Greek. Ionic Crosses flare out at the ends and Greek crosses are of equal length on each arm, like a plus-sign. The Fr on this gravestone marker stands for Father, indicating that the deceased was a Catholic priest. The symbol at the bottom of the headstone is the crest of the Order of Carmelites. The full emblem for the Order of the Carmelites is shown in the color picture to the right of the gravestone. 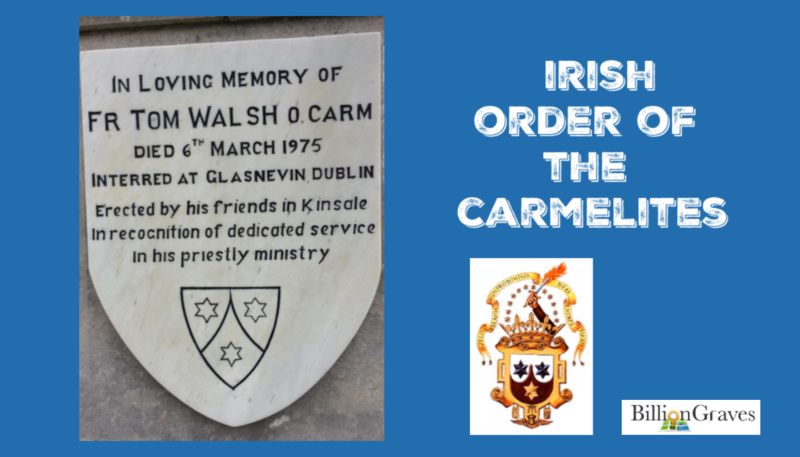 The Order of the Carmelites was a Roman Catholic religious order founded in the 12th century on Mount Carmel during the Crusades. The earliest Carmelites were hermits that lived secluded lives on Mount Carmel. The spiritual focus of the Carmelite Order was on prayer and serving the community. It is commonly believed that the Old Testament prophet Elijah lived in a grotto on the side of Mount Caramel. This mountain is where Elijah challenged the 850 idol-worshiping priests of Baal and the prophets of the groves to a contest to determine whose god was in control. 1 Kings 18 describes how sacrifices were laid on an altar with a challenge to see whose deity could light the offerings on fire. After the priests of Baal failed, Elijah had the sacrifices doused with water. He then prayed to the God of Israel and fire consumed not only the sacrifice, but the stones of the altar. In many cultures, Jesus is pictured with Mary and Joseph as an infant. 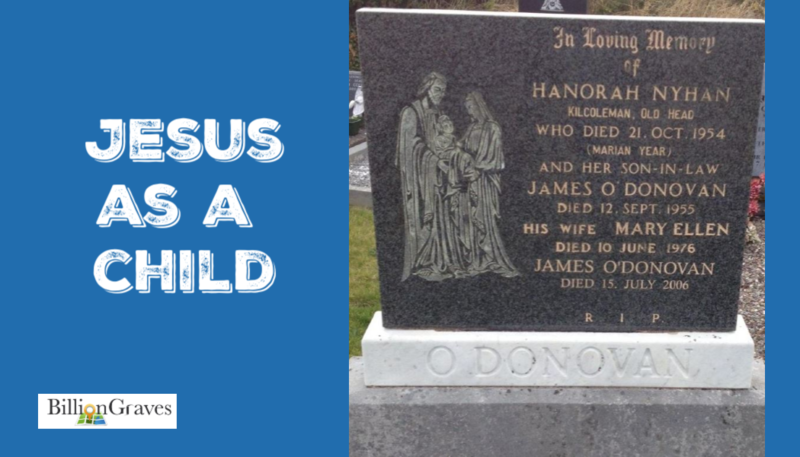 But on Irish gravestones, Jesus is commonly shown as a young child as seen in this photo. Jesus Christ is shown on this gravestone with a halo or crown of light. This is a symbol of holiness. He is holding the emblems of the last supper, bread and a chalice of wine. The baby Jesus and his mother, Mary, are engraved on this headstone, each with a halo of light. The halo indicates that both of them are considered holy or sacred. The base of the stone reads, “My Jesus mercy, RIP,” meaning that there is hope for mercy and peace for the departed. One of the most widely known symbols of the Roman Catholics of Ireland was the Sacred Heart of Jesus. It represents the boundless love of God for mankind. 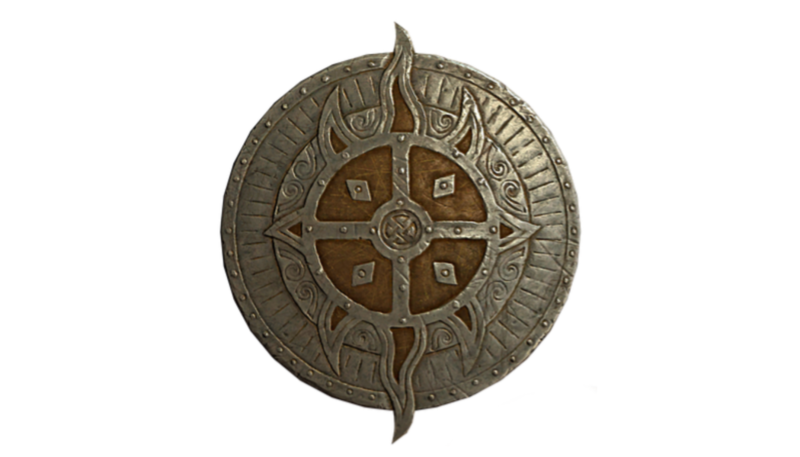 This symbol usually features a heart with flames and a cross protruding from the top, surrounded by a crown of thorns. The image on this gravestone shows Christ with a halo of light and his hand raised in token of a blessing. 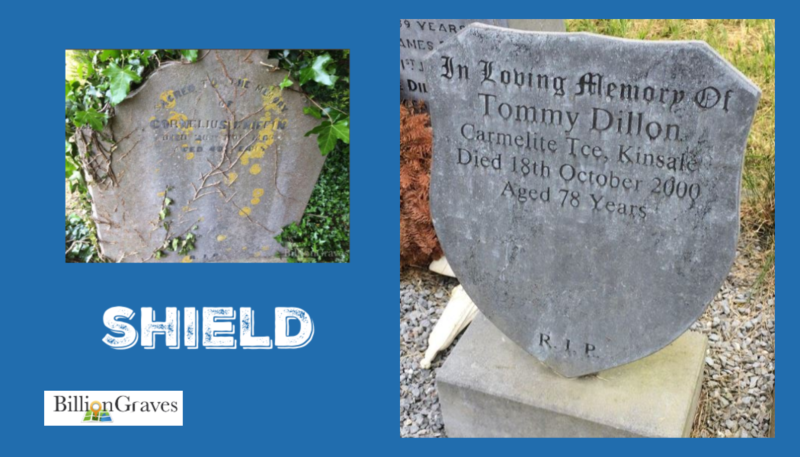 Shields are very common Irish cemetery symbols. They represent family crests or coat of arms and are symbolic of familial love. 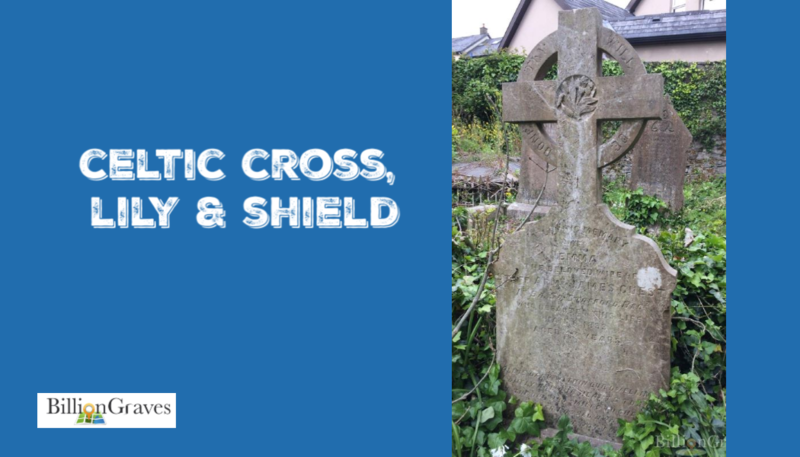 Irish Gravestone Symbol #18: Shield, Agony Cross, and R.I.P. This gravestone has three symbols on it. First, the shield or family crest is repeated on this gravestone. Second, there are two small agony crosses on the base. The Agony Cross comes to a sharp point at the tip of each arm. The points represent the nails that pierced Christ’s hands and feet on the cross. Lastingly, are the letters R.I.P. in tiny letters across the bottom of the shield. R.I.P. 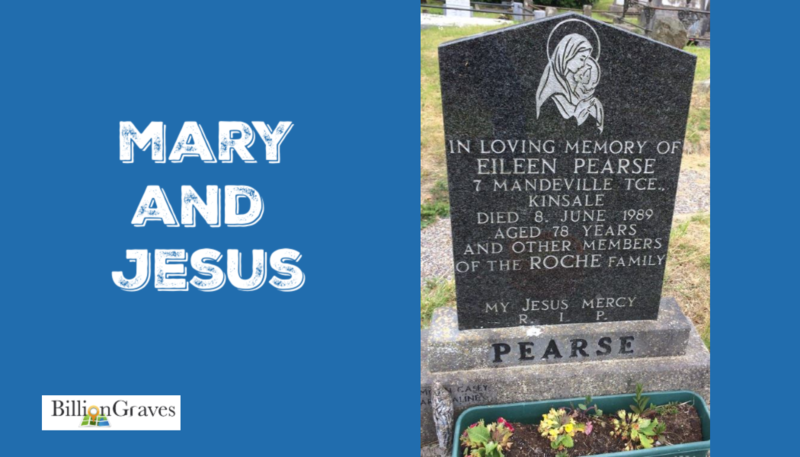 is the well-known abbreviation for Rest in Peace and it appears on many Irish gravestones. Shovels and spades symbolize death or mortality. This Irish gravestone has many symbols on it. The letters IHS, an abbreviation for Jesus, as mentioned above in symbol #9, are at the center of a laurel wreath. Laurel wreaths are symbolic of accomplishment and victory over death or immortality. On both sides of gravestone are flaming lanterns which represent light, wisdom, knowledge, faith, and revelation. Between the laurel wreath and the lanterns are two winged heads. Most often winged heads, winged cherubim, or winged skulls were engraved horizontally on headstones, but in this unique design the winged heads are vertical. The head symbolizes the soul of the deceased. The wings indicate that the soul has taken flight into heaven or in other words, resurrected. If all these symbols are read together, this gravestone says that the departed has obtained victory over death through the resurrection and light of Christ. Israel's Cemeteries Completely Digitized with BillionGraves App!